I grew up fearing eyelash curlers due to a bad experience as a kid when I walked the aisle as a flower girl and had one of my eyelids pinched by the make up artist during our primping session. To this day, I still subconsciously dodge the curlers whenever I have my make up done by pros during events and shoots. The cold feel of the metal against my cheeks always freak me out and I can't help but cringe and give out a lengthy speech about my previous mishap. I basically went through puberty, teens and early twenties without ever bothering to succesfully curl my lashes. And then came this blog and all these events that I had to go to and all these girls with pretty larger than life eyes which made me realize it was about time I conquered my (stupid) fear. Due to the shape of my eyes and most probably (very) short length of my lashes, I found it extremely hard to find an eyelash curler that was able to get to the very base of my lashes without pinching my lids. I started out mostly trying "asian brands" because according to my research online on various reviews, these (naturally) are supposed to work best for asian eyes. Either my eyes aren't asian or I'm just really weird like that because none of the ones I've tried (a lot) really worked for me. Being a big fan of Laura cosmetics, I finally decided to give theirs a try after witnessing how easy it was for Jeffrey Tasker to curl his lashes even without the help of a mirror. 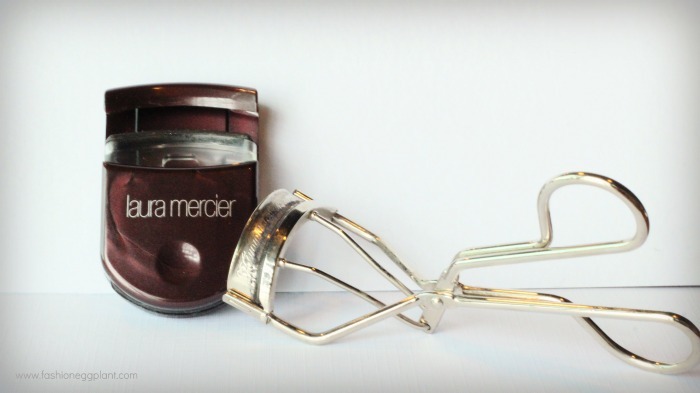 Laura Mercier's eyelash curler retails for about P995* and it was worth my every penny. It's made of plastic which means I don't experience that cold, uncomfortable/surprising feeling that I hate. It's sleek and compact, doesn't add much bulk to my cosmetic kit and it fits easily into any pocket/clutch, making it great for travelling. It's designed in such a way that it's almost impossible to pinch your eyelids and in case you manage to get it too close, it doesn't hurt at all. It works wonderfully on my short lashes. No bias, it's the best eyelash curler I've ever tried. The asian brand/asian eye thing in my opinion is bullcrap. Wasted so much money on that theory. It's really best to invest in a curler with a good design. You can purchase Laura Mercier products in the Philippines at all Rustan's Department Stores. Haha, you took the words out of my head. I was sold on the whole asian thing but 'those' curlers NEVER worked for me. I was beginning to think I had weird eyes coz everyone seem to be loving a particular eyelash curler. Or maybe, I just wasn't asian enough. Anyway, I found one that worked and thankfully it's cheap, a watsons brand curler that costs Php 65.